At 40, many would have hung up their boots and settled in the comforts of the commentators box. But not Leander Paes. Paes is still competing and winning titles, and his legend grows with each passing year, and each passing tournament victory. And he is showing no signs of slowing down. Leander Paes, who just won his 14th Grand Slam title, has been India’s pride and joy for over two decades now. This week, he and his Czech partner Radek Stepanek won their second Grand Slam together beating second seeds Austrian Alexander Peya and Brazilian Bruno Soiares in straight sets in the final in the men’s doubles event at the US Open. With the win, Leander has now won eight doubles Slam titles and has earned the distinction of having won a Grand Slam title in each of three decades. Paes shot into prominence when he won the 1996 Olympic bronze medal in men’s singles tennis. Before the event, Paes was ranked 127th in the world and needed a wildcard to enter the main draw. He proceeded to have a dream run before coming up against Andre Agassi in the semis. Although he lost the Agassi, he won many hearts. 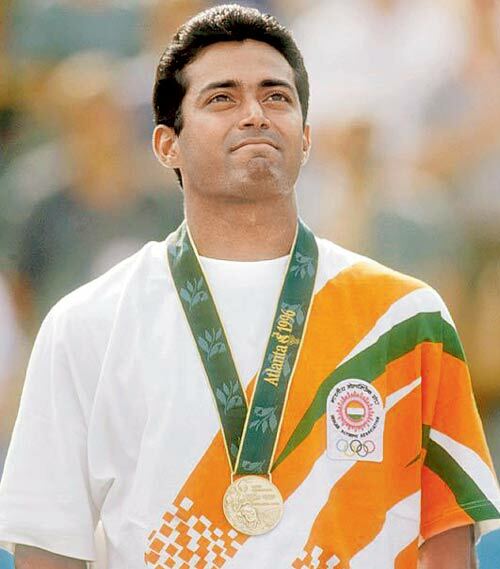 Paes went on to beat Fernando Meligeniin in the third place play-off, thus becoming the first Indian to win an individual Olympic medal since KD Jadhav’s wrestling bronze at the1952 Helsinki Games. For the achievement, Paes was honored with the Rajeev Gandhi Khel Ratna the following year. But since then he shifted focus to doubles. His legendary pairing with Mahesh Bhupathi, famously know as the “Indian Express” put doubles tennis on the map in India. In 1999, the duo created history by reaching the finals of all four grand slams. Paes and Bhupathi won the French Open defeating Goran Ivanisevic and Jeff Tarango 6-2, 7-5 and followed it up with triumph in the Wimbledon beating Paul Haarhuis and Jared Palmer 6-7, 6-3, 6-4, 7-6. The duo were runner-up at both Australian Open and US Open. However, sourness leaked into the Lee-Hesh bonding soon after their achieving the zenith of success, due to reasons which still remain engrossing topics of gossip. They eventually split up. Paes has been the flag-bearer of Indian tennis for two decades now. But he is in no mood to rest on his laurels. Paes also revealed that he is determined to make a record seventh appearance at the Olympic Games (Rio 2016), at the age of 43! And with the tennis that he displayed at the hard courts of US, Indian Tennis fans can dream big.